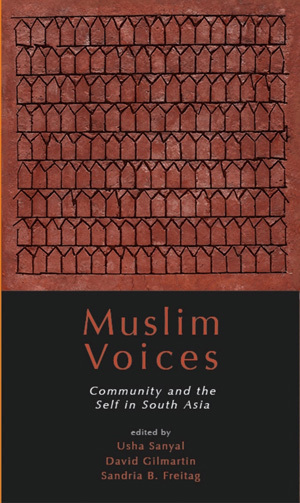 Muslim Voices brings together original scholarship that examines the changing contexts, concepts of community, and notions of the self shaping South Asian Muslims – some 40 percent of Muslims in the contemporary world- in the nineteenth and twentieth centuries. The essays in this volume recognize that identities are constantly being negotiated in changing historical circumstances, a negotiation which involves addressing tensions and conflicts around issues of authority, gender, social justice, and public versus private space. They further our understanding of the worldviews of specific Muslim “voices” and by placing them in their context, they also illustrate processes of change, contestation, and ultimately of political engagement. Drawing inspiration from the work of the eminent Islamist Barbara Metcalf, and using a variety of sources ranging from the literary to the visual, the essays in this volume have been contributed by both senior historians as well as young voices in the field. The book will be of particular interest to students and scholars of history, anthropology, political studies, cultural studies and the informal lay reader interested in the worldviews represented by the Muslim “voices” featured in it.